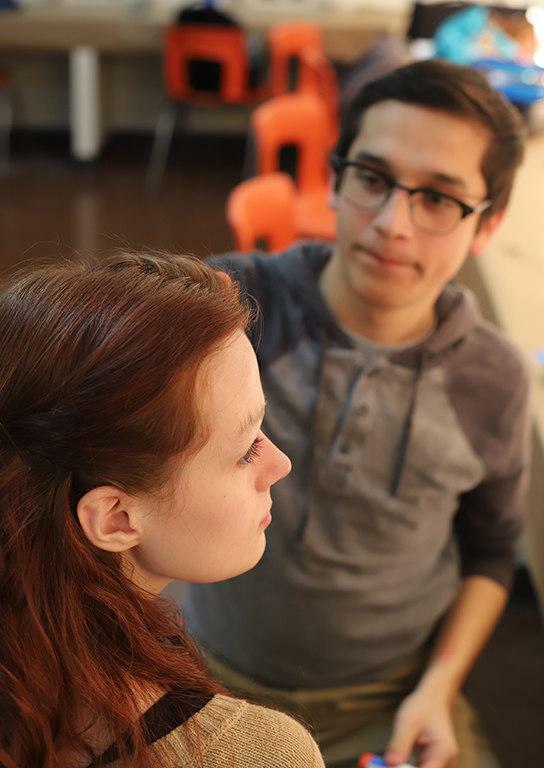 A soft chatter in discussion on how to apply makeup can be heard in the distance. 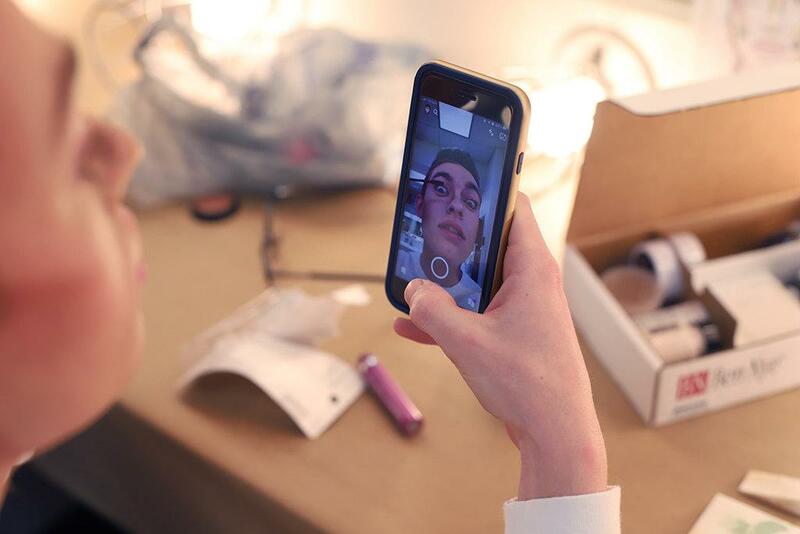 A view of costumes and makeup products fill the room and makes it hard to focus on a single thing. It’s brightly lit with large lightbulbs and surrounds the actors with self-reflections on the large mirrors. 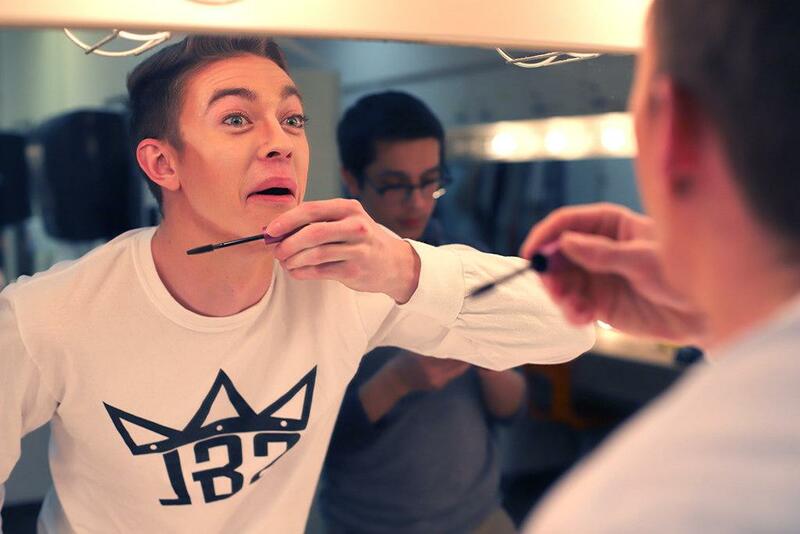 The dressing room is where the cast gets ready before every show and is taught all about makeup. 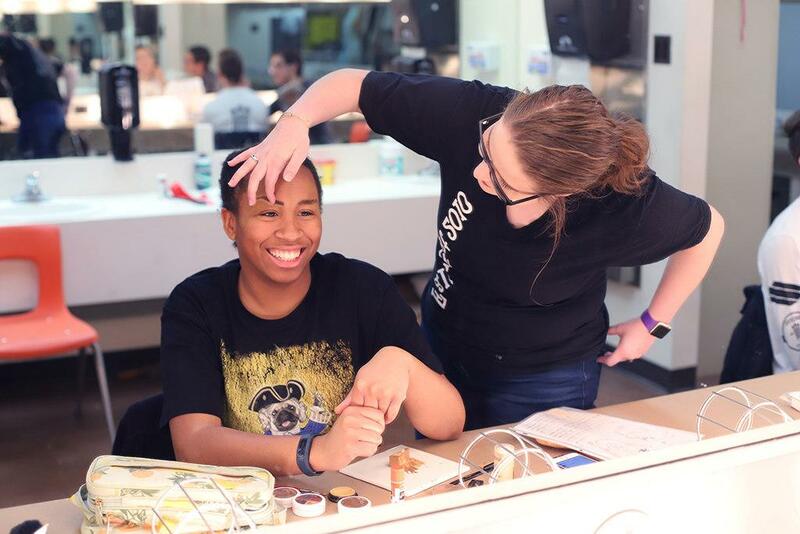 In preparation for Urinetown: The Musical, the cast and makeup crew work towards the finalization of the designs and looks that will be presented on the main stage. 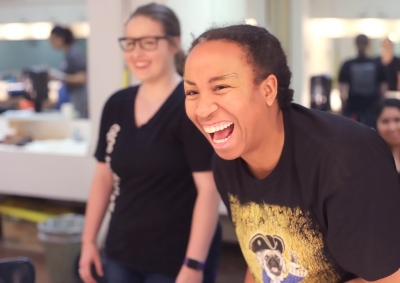 Each creative aspect of the performance takes time to perfect, and the characters’ looks play a role in the unique experience the cast is able to bring to life the story to the audience. Makeup, costumes and hair are a crucial piece in the overall creation and impact of the character or the production of a musical. Three people, Chris Cruz, theater junior, Abby Allen, theater education sophomore, and Alyssa Angelo, theater education freshman, take on the task to transform actors into the characters themselves in Urinetown. Before his hands touched the brushes and makeup, Cruz created a look for the actor or actress that will be appropriate for the character and ensure that it can depict all his work when presented on stage. He worked alongside Allen and Angelo to mask the actors accordingly. 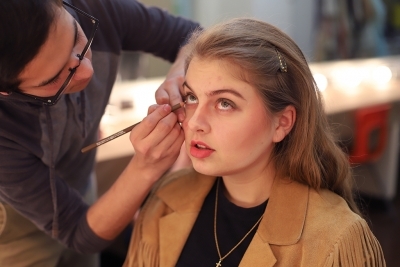 After the makeup designer constructed the look of the makeup, the cast re-created the artistry for each performance during Urinetown. 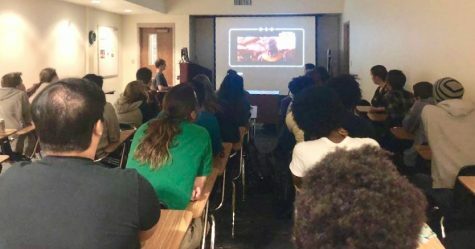 As he carefully read the script and directly started to note the visual designs, Cruz prepared his binder full with labeled sticky tabs and mug shots of the cast members for future reference. He then sketched up the detailed visions needed for each character to be brought to the main stage. 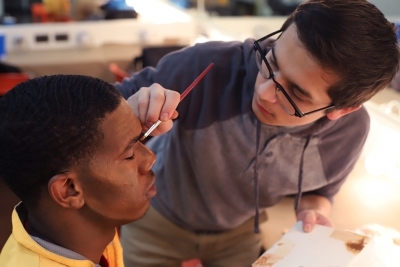 The comfortableness Cruz had with his lessons allowed students at the makeup call to learn how to apply their makeup and the special techniques needed for the characters’ look. 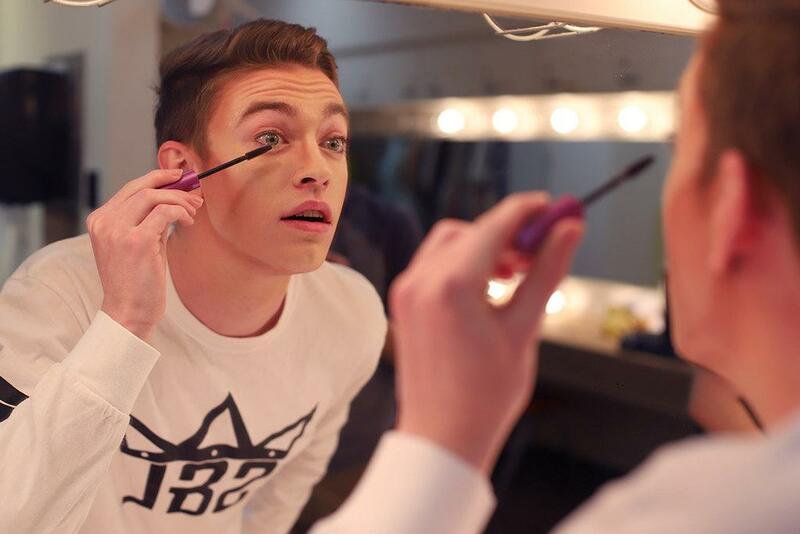 Although Cruz provided actors with tips and suggestions on how to re-create their makeup, each cast member might have preferences on what products they’ll use to get ready for each performance. In theater, a commonly used makeup brand is Ben Nye, which is known for it’s quality, how versatile it is, and it’s affordability. Ilka Megee, Hope Cladwell and theater education sophomore, uses different makeup products to create her character’s makeup look for the stage. 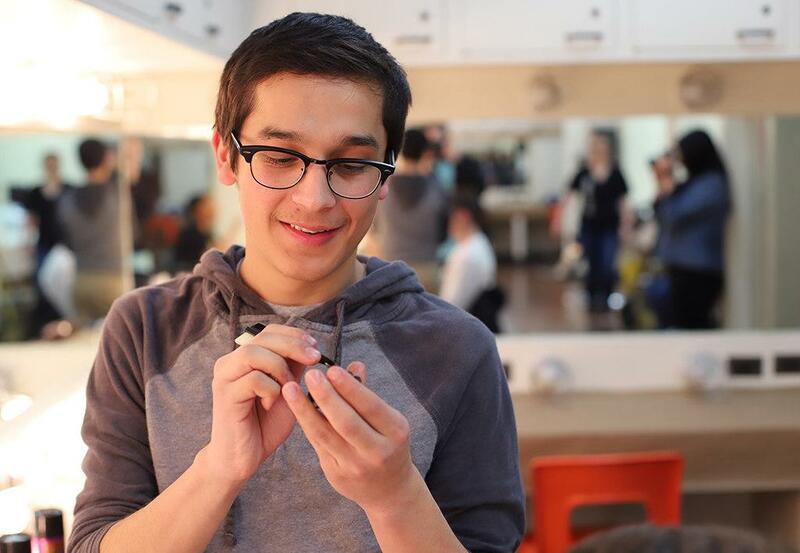 “We use Ben Nye in the theater. My favorite for eyebrows is Anastasia, and it’s also the red lipstick that I use for the show,” Megee said as she listened for her instructions before rehearsals. With his knowledge on stage makeup, Cruz made sure every person knew how to prepare for the show. According to Cruz, each cast member’s station would be set up and he was going to get ready before everyone else to make himself available for anyone who needed his assistance. Kendall Jones, vocal performance and biology freshman, said he wasn’t experienced with using makeup at all and usually needed help. “I call either Chris or Abby to make sure I’m doing it right. That’s my technique,” Jones said. 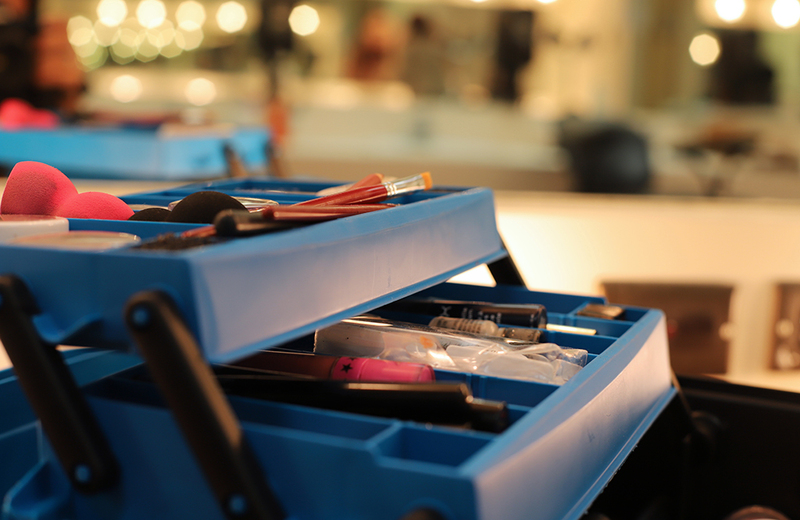 Because of the composition and lighting of the theater, the actor’s stage makeup is distinct and depends on unique techniques in order to execute the designer’s vision. 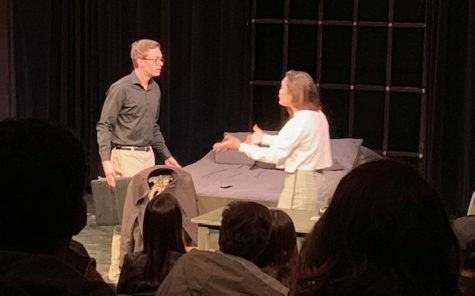 As the lights in the room grow dim and the audience settle into their seats, the distinct light sources hit the stage and brings the audiences’ focus to the actors. Faces are one of the first things that is noticed. Makeup gives the audience information about the characters and help create their backstory. It helps accentuate the distinct features on the person’s face without getting erased by the bright lights shining on stage. 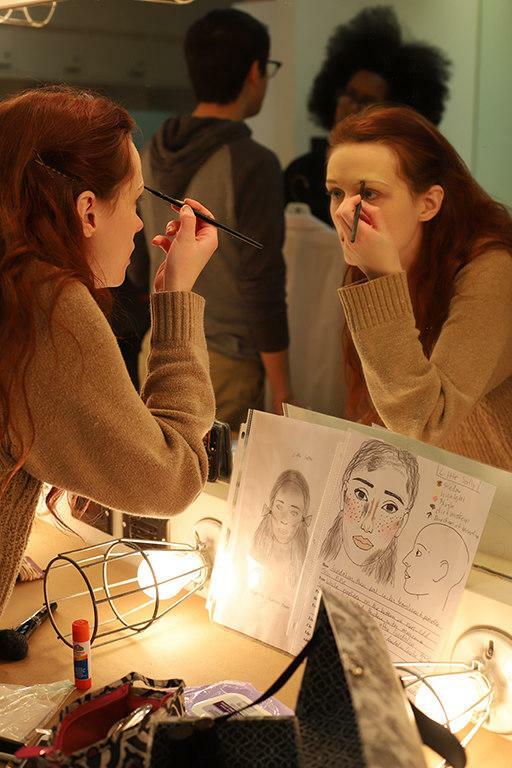 Many factors take part in the way the actors and the designer choose to apply the makeup because it needs to last the entire sure without many touch ups. 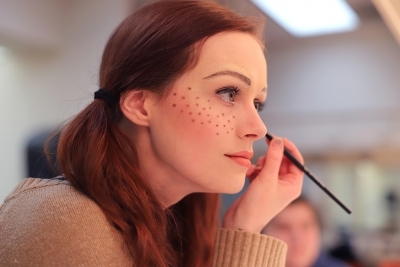 The techniques can impact the capability of the makeup to withstand the sweat, long periods of time and any sudden costume changes. 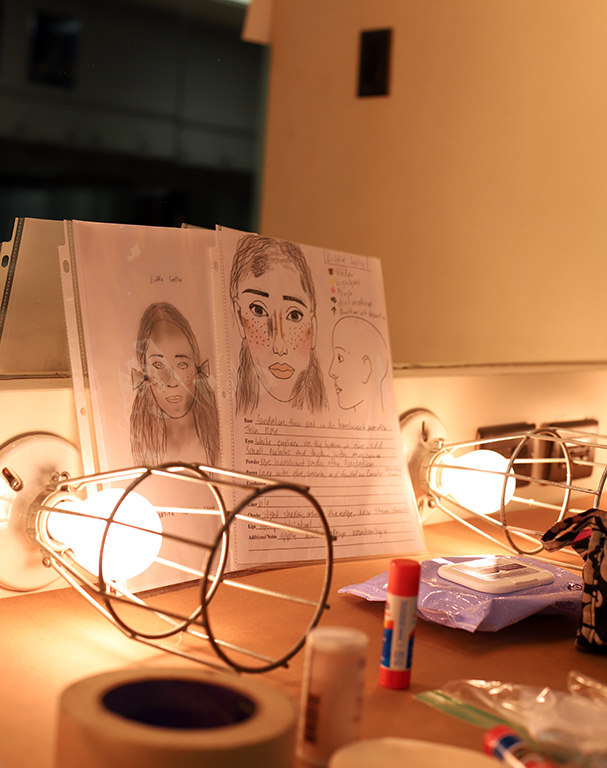 The lighting is an element taken into consideration by the designer and actors when applying the makeup. 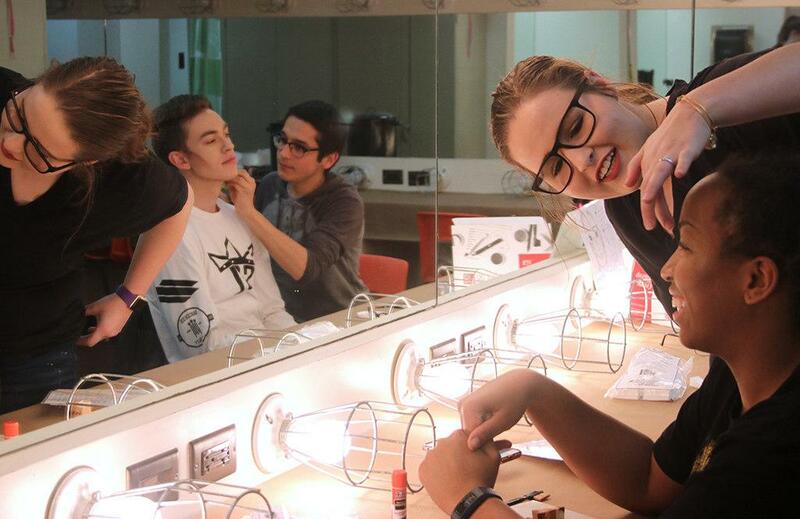 Because of the variation of lights in use throughout the musical, lighting techs can alter the way the colors of the makeup may appear on the actors. The designs need to be presented accordingly and be able to properly present the character to the audience. 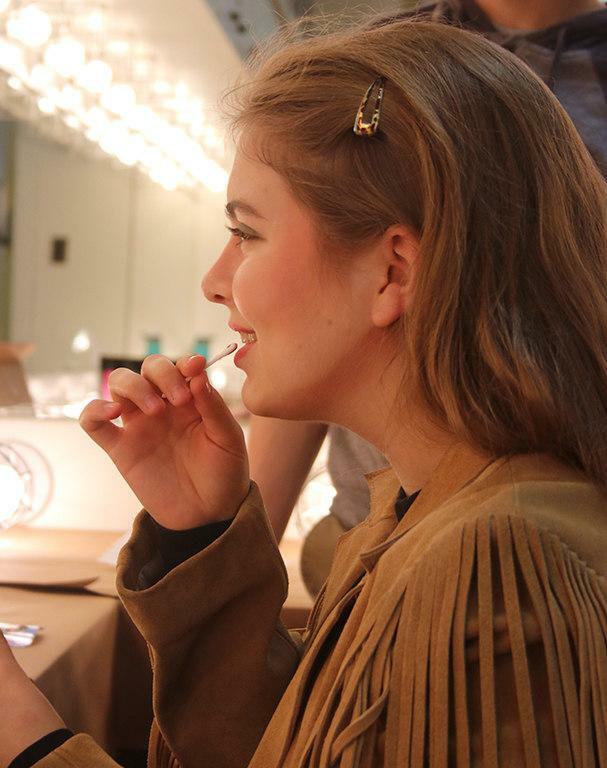 When asked about the techniques and makeup, Amanda Wilson, vocal performance sophomore, said it was her “first time working with stage makeup,” and didn’t know many techniques when it came down to doing it herself. 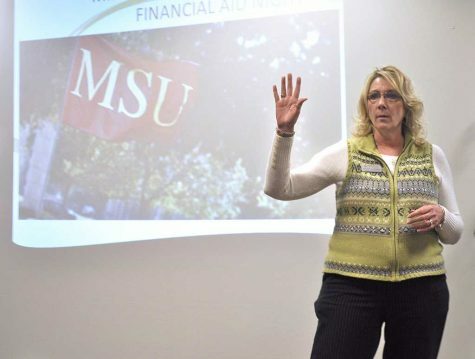 “Honestly, a lot of it goes over my head, and Chris is the only one saving me here,” Wilson said as she laughed at her response. 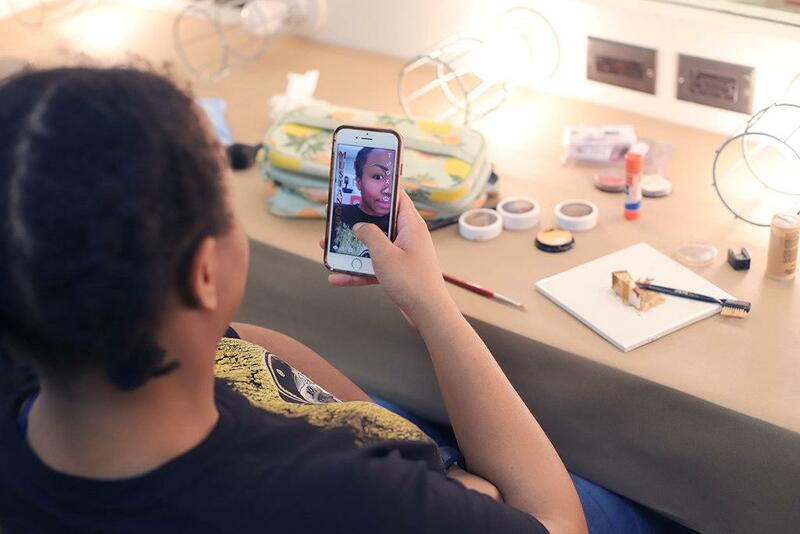 After she attentively observes every brush stroke on her face during makeup call, Wilson went home with the new ways to apply her character’s makeup. “I thought the whole contouring thing was interesting. 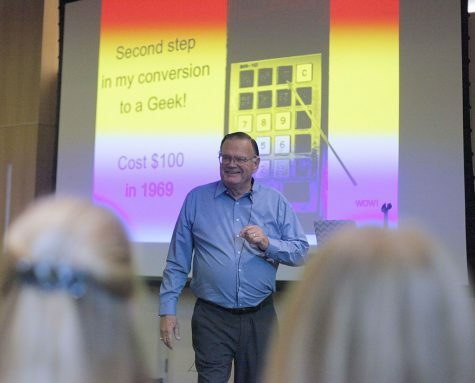 I never realized that you had to contour just to see somebody’s facial features,” Wilson said. Cruz went over the designs with the cast members and allowed them to use his sketches as a reference to look back at. Before anyone left to go on stage, Cruz checked on the actors and makes sure the makeup was done correctly. Each actor had their own way of preparing for the musical performance. Jones said his favorite part of getting ready for a show was to listen to music that gets him “hype,” before he has to go perform on stage. 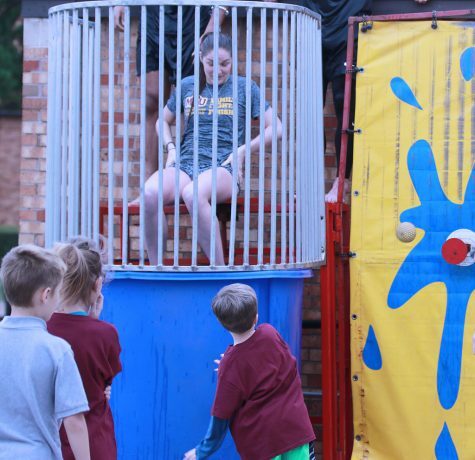 Wilson and Megee, however, said they both enjoy putting on their makeup and costumes. 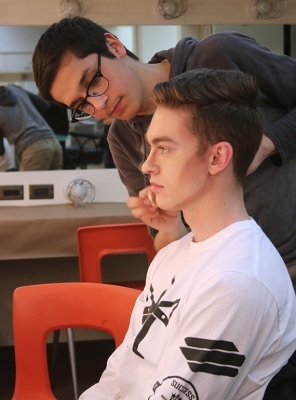 The makeup works alongside the costumes to help portray the actor’s character. It is able to provide the cast of actors with the visual transformation and development of the character they rehearsed as for weeks. “I just feel more in character,” Wilson said. Megee describes how different it is from rehearsing out of costume and without makeup to getting ready before a show.